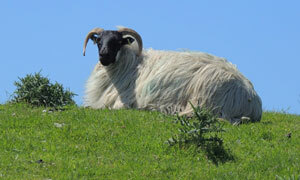 The Black-faced Sheep is the type of sheep which lives and breeds in County Mayo. They are smaller and hardier than other sheep and are horned in both sexes. As their name suggested, they have black or black-and-white faces and legs. The Mayo Black-faced sheep generally weighs around 60kg live weight and when under lowland conditions is capable of producing 1.5 lambs reared/ewe to the ram. It is noted for mothering ability, hardiness, milk traits and resistance. These sheep have long coarse wool which protects them from rain and cold winds; they can withstand the harsh climate of the western coast of Ireland and survive on plants such as heather. After the Great Famine during the 1850’s, the Irish Landlords, who owned vast estates in the mountains, imported thousands of these sheep from Scotland, through Killary Harbour. The Black-faced Sheep of the Connemara and Mayo area are probably descended from this original importation.